Serve media to your users around the globe – fast! Remember for this test we have only tested Rackspace’s Cloud Files not Rackpaces Cloud Servers. For our tests we were using around 16GB/month on Cloud Files on one of our more popular sites where a large number of images are stored, currently around 66,000 requests a month with nearly 4000 files coming in at 0.40GB total in size. For the above statistics we were charged a total of around $5. 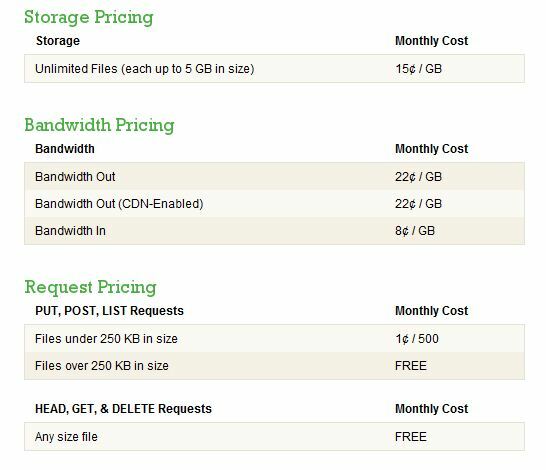 The cost taking into account how much a dedicated server would cost is very little so we can then host the rest of our site on very low powered Shared Hosting Account, VPS or dedicated server with little bandwidth or hard drive space. Therefore it is a financially viable way to host your files. In relation to speed, Rackspace Cloud Files appear to load as quick as, if not quicker than, images of an equal size elsewhere. We will carry out proper speed tests in due course. We quite like that Rackspace Cloud File comes with a control panel to allow you to manage your files, unlike Amazon’s S3 that throws you in at the deep end so-to-speak and expects you to find your own tools. We found that fireuploader(firefox plugin) is a great tool to use with Rackspace Cloud Files. Unfortunately at the moment Rackspace Cloud Files does not support Cname, for more detailed information on Cname use a reliable search engine, but for now it basically means that you are unable to to make the file ‘appear’ to come from your domain. After talking with Rackspace Support, they have informed me that this feature is due to be implemented in Q2 of 2010. We will keep you updated on this.